1. Sift the flour into a large bowl and season. Add the eggs, oil and milk and whisk until thickened. 2. Heat a 20cm non-stick pan on high and wipe with oiled kitchen paper. Add half a ladleful of batter and tilt to make a thin layer. Cook for 1-2 minutes on each side. Set aside and keep warm. Repeat to make 8 crepes. 3. For the filling, heat the oil and cook the shallot for 4-5 minutes, add the mushrooms and thyme and cook until soft. Add the spinach to wilt. Turn down the heat, add the ricotta, cheese and milk and stir. 4. Spoon some filling onto one half of a crepe. Fold or roll to enclose, then serve immediately. Cook’s tip The batter, pancakes and filling can be made in advance. Simply reheat before serving. 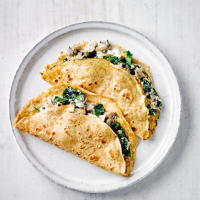 Or use ready-made Waitrose Crêpes instead. 1 of your 5 a day; high in vitamin K.